Algae is the world’s most efficient photosynthesizing plant (Photosynthesis is a process used by plants and other organisms to convert light energy, normally from the Sun, into chemical energy that can be later released to fuel the organisms’ activities.). Algae is an informal term for a large, diverse group of photosynthetic organisms which are not necessarily closely related and are thus polyphyletic. Included are organisms ranging from unicellular genera, such as Chlorella and the diatoms, to multicellular forms, such as the giant kelp, a large brown alga which may grow up to 150 feet in length. Most are aquatic and autotrophic and lack many of the distinct cell and tissue types, which are found in land plants. The largest and most complex marine algae are called seaweeds, while the most complex freshwater forms are the Charophyta, a division of green algae.Naturally growing algae and seaweeds are an important source of food to animals, including humans. They provide many vitamins including: A, B1, B2, B6, niacin and C, and are rich in iodine, potassium, iron, magnesium and calcium. In addition, commercially cultivated microalgae, including both algae and cyanobacteria, are marketed as nutritional supplements, such as Spirulina, Chlorella and the Vitamin-C supplement, Dunaliella, high in beta-carotene. Algae are common foods in many nations, such as China, Japan, Ireland, Chile, Wales and, New Zealand where they base traditional dishes from different types of algae. In North America algae has traditionally been used along the west coast from California to British Columbia, and also in Hawaii.The oils from some algae have high levels of unsaturated fatty acids. Some varieties of algae favored by vegetarianism and veganism contain the long-chain, essential omega-3 fatty acids, docosahexaenoic acid (DHA) and eicosapentaenoic acid (EPA). Fish oil contains the omega-3 fatty acids, but the original source of the omega-3 fatty acids in fish oil is from the algae (microalgae in particular), which are eaten by marine life such as small crustaceans and are concentrated and passed up the food chain. Algae have emerged in recent years as a popular source of omega-3 fatty acids for vegetarians who cannot get long-chain EPA and DHA from other vegetarian sources such as flaxseed oil, which only contains the short-chain alpha-linolenic acid (ALA). Algae can also produce nutraceutical-grade natural Astaxanthin from Haematococcus pluvialis microalgae. Natural Astaxanthin is a high value antioxidant which is difficult to produce, has limited global supply and unmet demand from a quickly growing consumer base. Astaxanthin is a carotenoid. Carotenoids are organic pigments found in the chloroplasts and chromoplasts of plants and some other photosynthetic organisms. Carotenoids can be produced from fats and other basic organic metabolic building blocks by all these organisms. Carotenoids generally cannot be manufactured by species in the animal kingdom, so animals obtain them in their diets by eating things that naturally contain Astaxanthin, and may employ them in various ways in the metabolism. Uses of Astaxanthin & Synthetic vs. Natural Astaxanthin. Natural Astaxanthin is used primarily as a food supplement for human consumption. 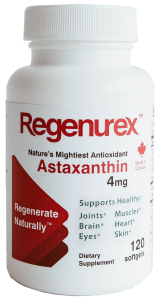 Among other things, Astaxanthin is a powerful antioxidant that neutralizes damaging free radicals known to cause oxidative stress and inflammation, the biological underpinnings of the aging process. Clinical studies show that Astaxanthin has beneficial effects on oxidative- and inflammation-associated health issues including cancer, diabetes, Alzheimer’s, heart disease, auto-immune disorders, eye and skin health and central nervous system and brain health. Haematococcus pluvialis produces Astaxanthin during stressing, achieved by drastically changing environmental factors. Producers of Astaxanthin from Haematococcus pluvialis grow the microalgae in a number of different environments, including open pond, closed photo bioreactor and even tubular reactors laid out in the desert. Haematococcus pluvialis cultures are seeded in water and growth media and then fed light and CO2. The microalgae are eventually separated from the water and then further dewatered to 25% solids. The final process involves extraction of the Astaxanthin. The major producers of natural Astaxanthin all employ either complex photo bioreactors (ensuring a high level of quality control, but at extremely high costs) or traditional open pond systems (providing low yields and limited control, but at lower cost).